a thread from the edge: Wait - - - I'm Coming!!! Wait - - - I'm Coming!!! Tomorrow is the deadline and as usual I'm jumping on the caboose - wait for me!!! 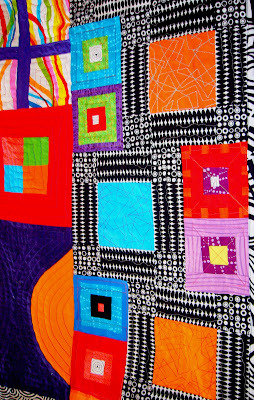 The deadline is that of the Blogger's Quilt Festival hosted by Amy Ellis and a collection of sponsors from the world of quilting - the idea - quilt bloggers post a favorite quilt and link into Amy's site where thumbnails of your quilt, linked back to your blog, are posted in an on-line quilt show. This is the first time I'm entering - looks like fun! What do you think of my entry??? 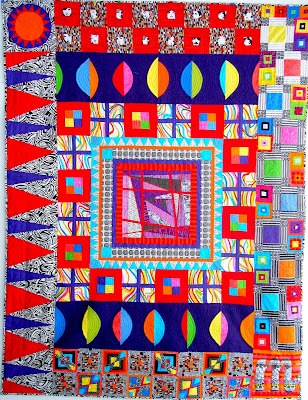 This is the quilt I created for my oldest daughter's graduation from high school - and yes, there is a lot going on in this quilt. It all started with a purple quilt - I was convinced she would love a simple purple quilt - - - not so fast - - - she had her own idea of what she wanted and it was far from simple. 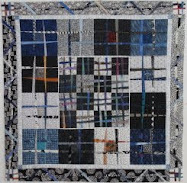 I like to think of this as a quilt sampler from someone who's a thread from the edge. 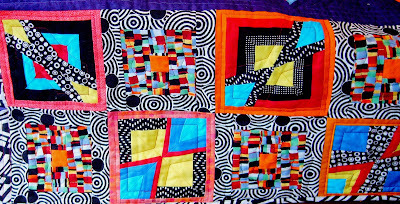 Many of the elements were inspired from art quilts - it's all about color, and black and white. Take it all in . 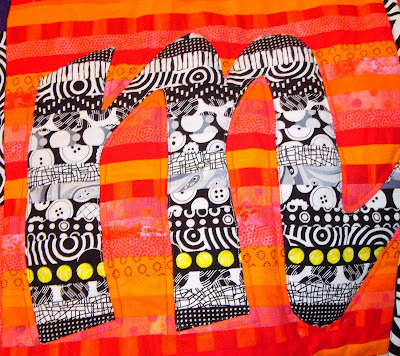 . .
Now let's break it down into more manageable components so you can appreciate my level of instability - here's her M - her name is Meredith so I decided she needed an M.
This is a section from the right border - if you refer back to the whole quilt you can see how sections of the border gradate from white to black as you move down the quilt. 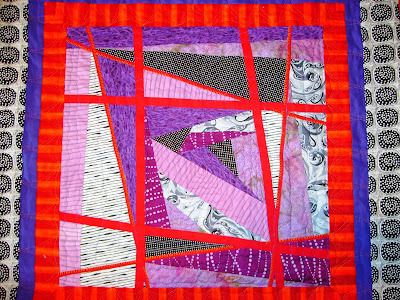 Here's a close up of the surface design stitchery I added to the squares in the left border using contrasting thread. 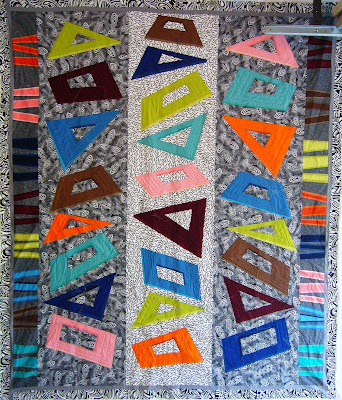 This is a color block section and one of the inner borders - I really like the quilting in the color block sections. I called this section the seeds - again, I really love the quilting in this section - or the sewing of the seeds - get it??? 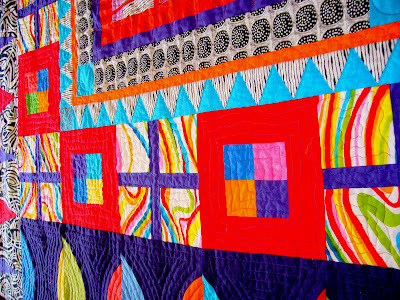 I love this fabric - the face fabric - I'm fairly certain it was Alexander Henry - this is one of the borders on the top of the quilt. 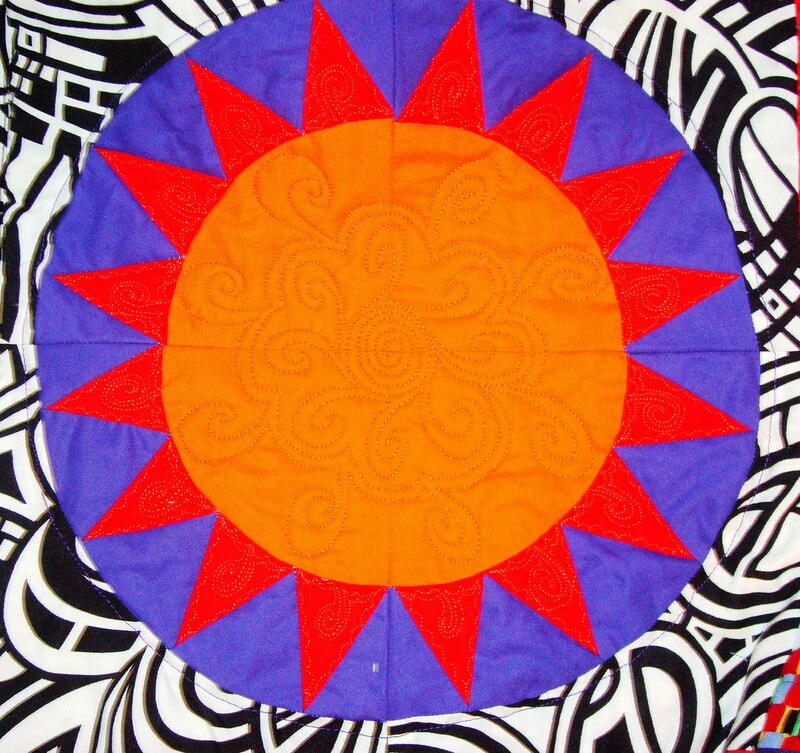 My mandala sun - I had a lot of fun with quilting this section. 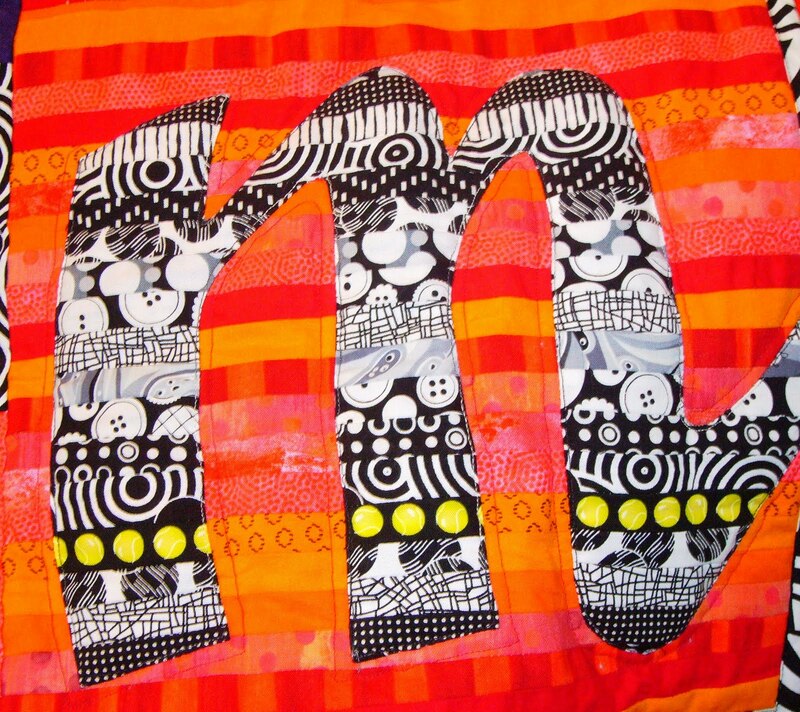 This is one of the borders on the bottom portion of the quilt - I call these my propellers. I designed them on paper and then paper pieced them - there are two different designs. 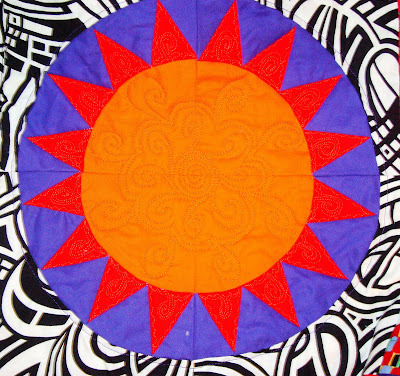 Here is the center block - a quilt in itself if you ask me - paper pieced. 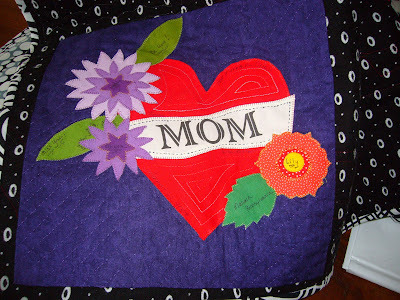 This is the label I put on the back, a flannel back (she goes to college in Boston and needed the extra warmth) - I'm not a label person, but felt this quilt warranted it - this is the tattoo she is forbidden to get. Let's talk about size for a minute - this quilt measures 90 x 110 inches - and, yes, I quilted the whole thing with my Bernina, and yes, it's heavy as all get out, especially with the flannel. 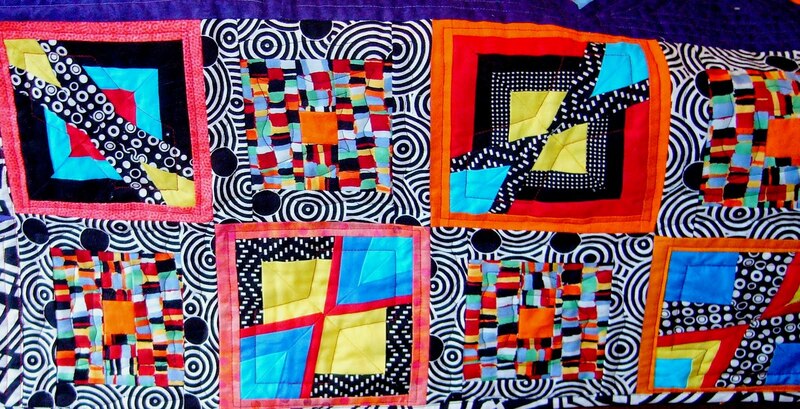 I'm going to regret posting the next photo - why - because this quilt is still not yet finished - this is my younger daughter's graduation quilt (she graduated in 2009, and I know 2011 is staring me in the face). I'm getting there Liv!!! My inspiration - a mobile! Liv and I had a smitch of trouble meeting a comfortable creative ground - she is an artist and is what some might call opinionated. 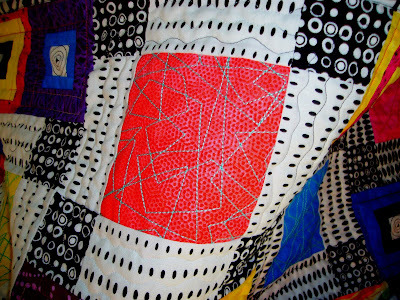 Why is this not yet finished - the quilting - what a bear! It measures 90 x 110 and is jut a beast to handle in the Bernina. 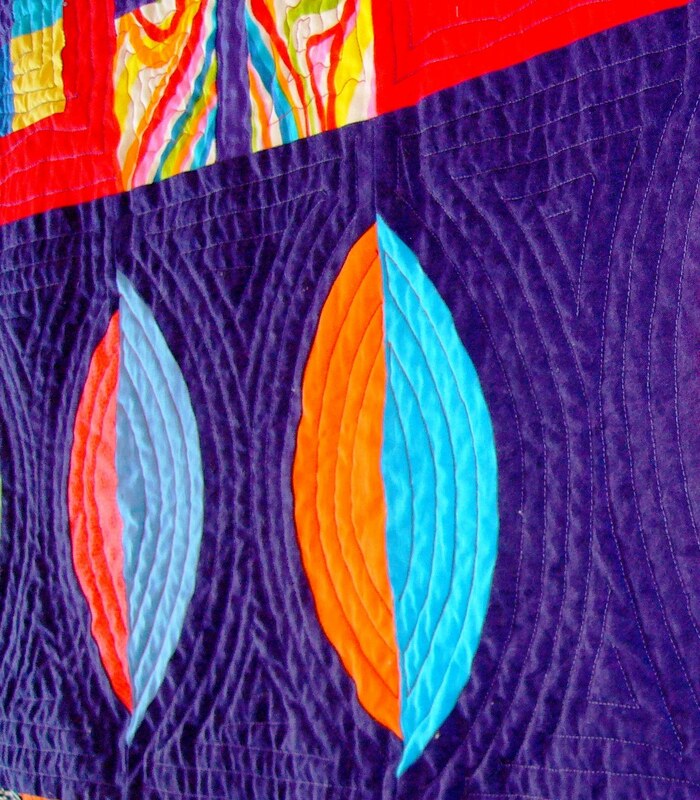 Take some time to visit the Blogger's Quilt Festival! Wow!. What a huge amount of work. This is such an incredible quilt. 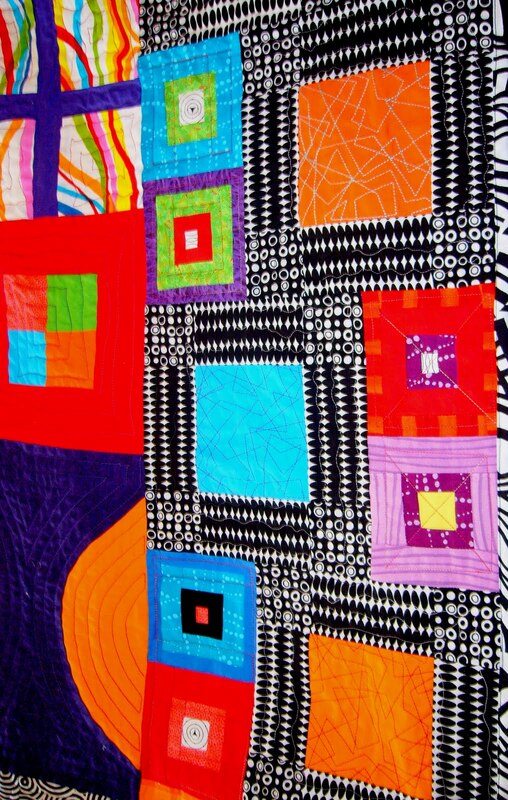 I love the wonderful work you have done and am full of admiration!!! What an amazing quilt - you do not shy away from blod colour or design choices! Really cool. 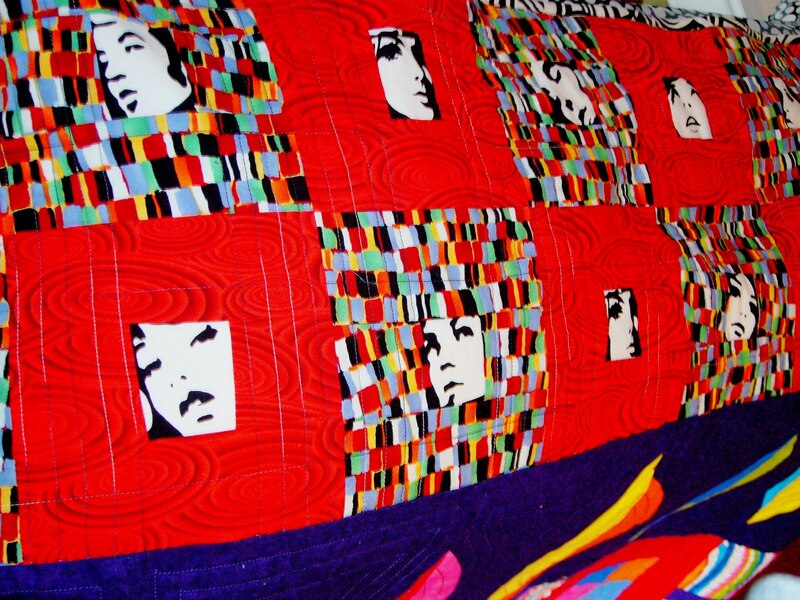 I am so happy to see Meredith's quilt again - it is spectacular! And yes,I can understand how you and the artist Olivia have opinions about her quilt! Beautiful, creative, colorful, unique work! Sculpture in the Great Outdoors!